On the 3rd March we led an assembly about almsgiving and fasting. Our school has been doing fundraising for a variety of charities during Lent. At the end of the assembly we offered everyone a chocolate exchange. Some students generously gave money for their selected charities. Recently many people have been doing charity events such as sponsored silence, cake sales and Cafod Family Fast Day. We are continuing to do this until our Easter holidays. The school have been praying for the victims of Cyclone Pam and the people of Vanuatu. All monies received from our second Lenten fast day on 27th March will go to the Cafod disaster fund. It is upsetting because in the last assembly we led we spoke about climate change and now we are seeing it in reality. This disaster has caused terrible destructionb and loss of lives in families, livelihoods and homes. Even though it was generated by these three things it was rather warm. We were not allowed to use hairdryers but I didn't mind. Everyone there was very friendly and helped us realise how lucky we are. Many people do not have what we have and we take them for granted. However, we need all your voices to stop Climate change. You could become eco-friendly like Othona. We can't do it alone but with your help anything is possible. If you picked up the litter you dropped you are helping the environment. If you stop smoking you are helping the environment. If you are struggling to think of ways you can help you can go to the CAFOD website. I recommend Othona as a place to get closer to nature. Following a three day conference with the Catholic Charity CAFOD students from St Mary's are starting this blog. Please look in to see future posts. See the CAFOD links here for more information. http://www.cafod.org.uk/Education/Young-people/Young-climate-bloggers Our bloggers are featured. 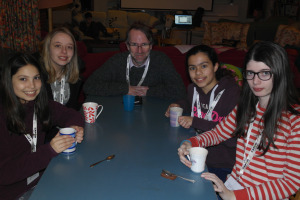 In January 2015 3 St Mary's students set out on a blogging conference on Climate Change run by the Catholic Charity CAFOD. The blog is the result of that conference. .